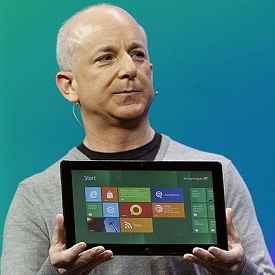 Home » Business » Why did Steven Sinofsky Leave Microsoft?? Steven Sinofsky has been with Microsoft for 23-years, he played a primary role in the launch of Windows 8, he was also the reason for the birth of Windows Surface. He was expected to be the next CEO of Microsoft, but then suddenly it all ended, he quit! Steven Sinofsky was the head of Windows Unit, he was the centre of media attention as he personally launched Windows 8 and Surface. But why did Steven Sinofsky quit at the height of his carrier? According to Microsoft Steven Sinofsky the resignation was handed in by Steven Sinofsky himself, and it was his decision to leave the company. The surprising turn of events is neither Microsoft nor Sinofsky has come out with an explanation. This sure could damage the image of Microsoft at a critical time. Sinofsky, 47, joined Microsoft in 1989 and made his mark as Bill Gates’ technical assistant. He grew into an uncompromising leader whose ruthless style of cutting layers of management and formalizing the process of software development gave rise to the term “Sinofskyization” in the company. In a later media statement, he added that it was “imperative that we continue to drive alignment across all Microsoft teams, and have more integrated and rapid development cycles for our offerings”. That could be interpreted as disappointment in Sinofsky’s ability, or willingness, to work with other units. Looks like politics within Microsoft could really hert its progress especially when it has no time to relax. Apple Paid Only 1.9% Tax Outside US! Professor Body-Slams a Female Teenage Student!! Next: Dakota Fanning Goes Brunette!